A fun and easy to cook treat that everyone loves is banana bread. 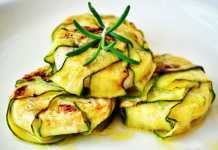 This recipe has been used throughout history because of how easy it is to put together as well as it tasting really good. All you really have to do is combine of all the ingredients and then throw it in the oven. It truly is the best thing since sliced bread! Moist and delicious banana bread recipe. Easy to make, no need for a mixer! 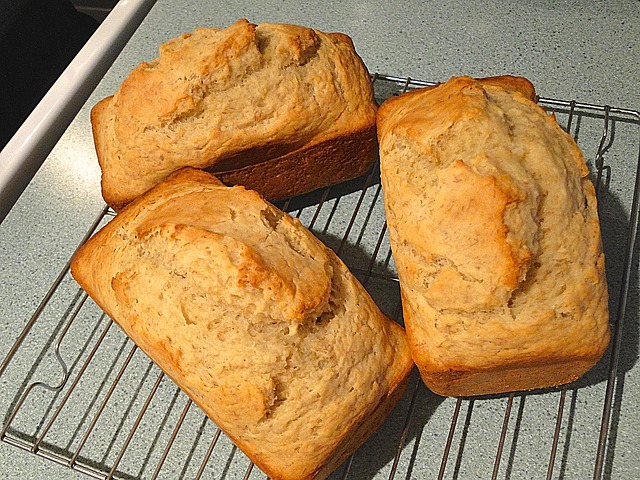 Ripe bananas, butter, sugar, egg, vanilla, baking soda, and flour. 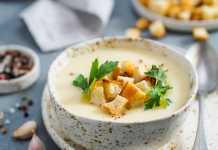 Below we are going to stick with a more modern rendition of the recipe so you should have no trouble finding all of the ingredients at your local super market. This banana-banana bread is always super moist and has amazing banana flavor. Try it toasted! Turn this bread into a dessert by simply adding toppings such as vanilla ice cream, caramel sauce, candied walnuts and a pinch of sea salt! Preheat your oven to approximately 180°C and grease a deep dish (at least 6cm) loaf pan. Combine all of your flour, cinnamon and brown sugar into a large bowl. Mash your 3 bananas and whisk your two eggs. Combine your melted butter and eggs together before adding it to the larger bowl. Once added stir through your mashed banana ensuring that the mixture is thoroughly mixed. Spoon the mixture into your loaf pan and smooth the surface. Bake the dish for 45 to 50 minutes or until an inserted skewer comes out clean. Set the dish aside for 10 minutes before serving. Serve the banana bread warm with your favourite spread. Banana bread is a classic recipe that someone from every household can enjoy. 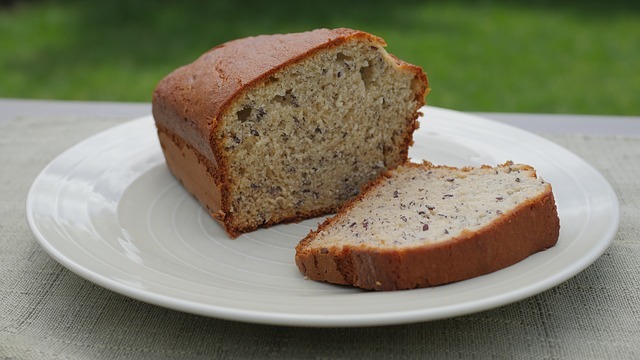 The treat itself combines the sweetness of natural bananas with the great and easy to eat style of bread. Bananas as a fruit were very difficult top transport in the 1800’s as it ripens and then rots quite quickly compared to other food. Due to there being no refrigeration in this period it was hard for captains to find a way to successfully import and export these products all over the world. While the fruit was very popular amongst those who get could their hands on it, there was a few events in history that really made it shine. Firstly the great depression that hit in 1930 led a lot of families to tighten their belt and make sure they don’t waste any kind of food. Unfortunately for a lot of households that means eating rotten food such as the yellow fruit that has turned to black. Secondly there was an abundance of baking powder on the market at the time as well which in turn reduced its price for consumers. With the desperation to use all parts of food including overripe bananas and the availability of baking products, many cooks came up with the idea of banana bread. The recipe would use the mashed, overripe fruit as the main ingredient where it started to appear in many different cookbooks. 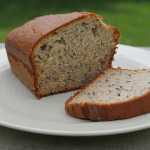 Due to its long history there are many different recipes for banana bread which include ingredients that were available at the time. 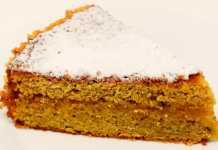 Overall though you will find that the recipe consists of bananas, a sweetener, some fat substance, flour and a chemical leavener. You may think that something with all those carbs and sugar in it isn’t very healthy for you, however it is also packed with bananas which have some major health benefits to them! These fruit are basically candy from mother Earth that are naturally sweet with a fantastic texture. The carbohydrates in them are perfect for that quick energy boost and are very effective at waking people up in the morning. The fruit also have a tonne of potassium which is one of the more known facts about them. However not many people realise the benefits of having potassium in your diet are. Potassium and magnesium are very important minerals for our body to regulate its healthy state. If your levels are up to scratch you will find that your blood pressure and cardiovascular health will be in tip top shape. It is also good for keeping your brain and kidneys healthy too! Bananas are a great food for keeping your body in fighting order. Firstly they have a type of fibre in them called Pectin which is very good in aiding your body’s digestion. The fibre in them can act as a very gentle laxative while the electrolytes keep your body hydrated. Additionally the fruit is very good at regulating your body’s blood sugar. If you have a sweet tooth and are trying to cut back on processed sugars, you will find that eating a ripe banana can satisfy those cravings!